Are you looking to get a new SUV? Are you, like many car-shoppers, having trouble distinguishing between all the numerous available models to choose from? Especially in the ultra-competitive and crowded midsize SUV segment, finding the right model for you can be difficult. But that’s why we’re here to help with our model comparison pages! 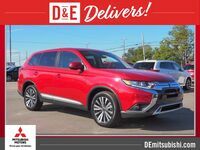 At D&E Mitsubishi, we believe that Mitsubishi vehicles always offer drivers the best value, but it’s not enough to tell you that, we’re going to show you! We compare the latest Mitsubishi models with their competitors so drivers can get a clear and accurate look at how they match up with one another. For this comparison, we’re going to find out how the 2019 Mitsubishi Outlander compares to the 2019 Hyundai Tucson in a battle of the midsize SUVs. We're going to look at the efficiency, performance and interior space of both SUVs to see which ones has more to offer drivers. We’re comparing the base trims of both models. Let’s see who wins this matchup! 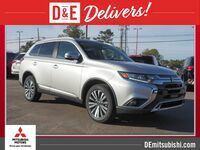 Test Drive the 2019 Mitsubishi Outlander at D&E Mitsubishi in Wilmington, North Carolina, Today! When looking at the specifications and measurements of both the 2019 Mitsubishi Outlander and 2019 Hyundai Tucson, it’s not hard to see why both are so popular among drivers! Both midsize SUVs have what drivers are looking for in the segment with efficiency, performance and interior space. However, when you look at the two side-by-side, there’s no doubt that the 2019 Mitsubishi Outlander comes out ahead. With the 2019 Mitsubishi Outlander, drivers get a stronger combination of a high-performing drive, fuel-sipping efficiency and large amounts of interior space. The 2019 Outlander is more efficient than the 2019 Tucson when it comes to combined fuel economy, but this doesn’t stop the 2019 Outlander from also offering plenty of performance and space. When it comes to horsepower, the 2019 Outlander also offers than the 2019 Tucson can despite its better efficiency. With the 2019 Outlander, drivers no longer have to choose between efficiency and horsepower! Not only that, but the 2019 Outlander also has more space on the interior when it comes to passengers and cargo. The 2019 Outlander’s third-row seating lets it seat more passengers than the 2019 Tucson, but it still offers plenty of space behind the second-row seating for those who need space for cargo. The 2019 Mitsubishi Outlander is truly a triple threat! Want to learn more about the 2019 Mitsubishi Outlander? Contact our staff at D&E Mitsubishi for more information or to schedule a test drive today!